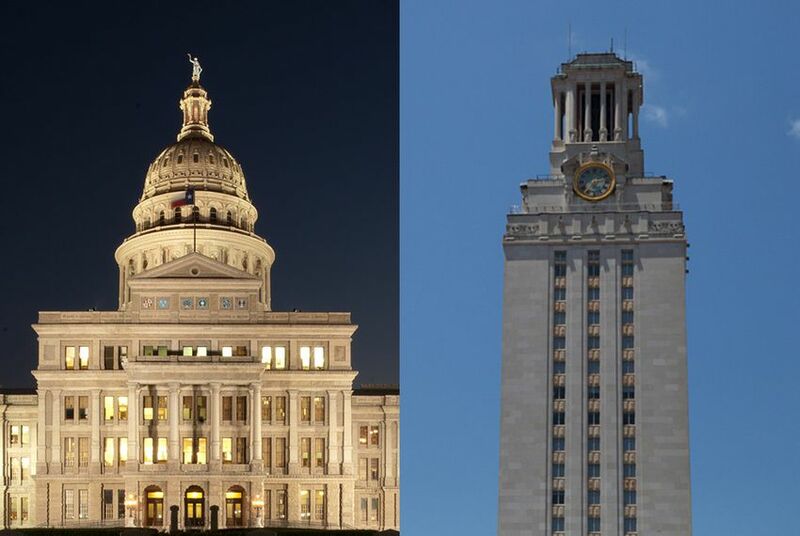 The Texas Capitol on the left, and the University of Texas tower on the right. For the past two decades, one accomplishment has guaranteed students a spot in the University of Texas at Austin: Graduate near the top of your high school's class and you're in. On Wednesday, state senators discussed repealing that promise at a hearing of the Senate Higher Education Committee. Black and Hispanic leaders touted the rule as perhaps the most important tool in trying to level the playing field for minorities in college admissions. But some senators and school officials cast doubt on its usefulness in 2017 and questioned whether the Legislature should be mandating university admissions at all. "The Top 10 Percent Rule is a blunt instrument," said UT-Austin President Greg Fenves, quoting a recent legal opinion authored by U.S. Supreme Court Justice Anthony Kennedy. The rule is simple. Graduate in the top 10 percent of your Texas high school's class, and you get into any public university in the state. The one exception is UT-Austin, where the sheer number of top 10 percent applicants once threatened to overwhelm the school. In 2009, the Legislature amended the rule to cap the number of automatic admittees to the Austin school at 75 percent of incoming freshmen. That usually means that students in the top 7 or 8 percent get in automatically. "Just taking the standard set of courses and getting good grades is an important factor," Fenves said. "It isn't the only factor." Committee members were discussing a bill by Sen. Kel Seliger, R-Amarillo, that would completely eliminate the program. Lawmakers have proposed such a change unsuccessfully in the past. Many suburban lawmakers loathe it, since the schools in their district are competitive and it might make it harder for their students to get into the flagship school. But the fact that Seliger, who is chairman of the higher education committee, is the author this time around likely improves its chances. Still, a complete repeal won't be easy. Democrats and some rural Republicans are fiercely protective of the rule, since it has given students in their districts access to UT-Austin that didn't exist before the rule was written. Lawmakers created the rule in 1997, a year after a federal appeals court ruling temporarily banned affirmative action in the state. The thinking behind it is that not all high schools are created equal. Schools in poor urban or rural areas tend to have fewer resources than the wealthy suburban schools. The poorer students come from less-educated families and tend to do worse on the SAT. Sometimes they can't afford extracurricular activities. But none of those disadvantages matter under the Top 10 Percent Rule. UT-Austin leaders, senators and higher education officials all acknowledged that the rule has helped rural students. The number of high schools that send students to Austin has gone up dramatically. But they said they were less sure of its impact on minorities. Hispanic enrollment at UT-Austin has increased significantly since the policy was put in place, but so has the number of Hispanic people in Texas. Meanwhile, UT-Austin officials noted that they are committed to diversity and won't abandon it if the rule is repealed. The university fought a years-long legal battle to preserve the right to use affirmative action. Last year, the U.S. Supreme Court upheld the practice. "We need to bring together students with a diverse range of life experiences and perspectives," said UT-Austin Provost Maurie McInnis. McInnis said the school would also commit to keeping the rule in place for the next two admissions cycles, even if Seliger's bill became law. That would be done, she said, to avoid changing the rules at the last minute for current high schoolers. The hearing on the issue stretched into the early evening, with Sen. Royce West, D-Dallas, grilling UT-Austin officials on the effectiveness of the rule. Then, several black and Hispanic leaders urged the committee to keep the policy in place. "If it ain't broke, don't fix it," said former Sen. Gonzalo Barrientos, D-Austin, who helped come up with the rule in the 1990s. The group also included Claudia Hernandez, a graduate of Thomas Jefferson High School in Dallas, which is less than 1 percent white and more than 85 percent economically disadvantaged. Her single mother, who had just a sixth-grade education, stressed the importance of college but wasn't able to offer much help in getting there. Still, Hernandez finished near the top of her class, enrolled in UT-Austin, graduated and became a lawyer. If it hadn't been for the top 10 percent rule, she said, she might not have even applied. "I truly believe that if I wasn't in the top 10 percent, they would have just looked at my SAT scores and kicked me out," she said. Seliger's bill, Senate Bill 2119, was left pending after the hearing. The committee will likely vote on it as early as next week. Last year, the Texas Tribune published a series on the history of the Top 10 Percent Rule and its impact on UT-Austin and the state. The U.S. Supreme Court upheld UT-Austin's admissions practices in June.